The sellers of today’s Nice Price or Crack Pipe Honda Accord are grandparents who the ad says are now past their driving days. We’ll just have to see if this classic hatchback comes with a price that’s too many grands as well. They say time heals all wounds however, the comments and 62-percent Crack Pipe vote on yesterday’s 1981 Chevy Citation X-11 certainly seem to prove otherwise. A hot version of a car people have for long been lukewarm to, that X-11 simply couldn’t overcome its own history. At least with a capacious load area under the hatch, it could easily carry all of that baggage. What kind of cars showed up the Citation back when it was new? Well, a prime example of how to do a FWD hatchback of modest proportions and expectations was, as you might have guessed, the Honda Accord. With the Accord, Honda took the recipe for the Civic—sensible design, high-quality build and pleasantly surprising feature set, and blew them up into five-quarter size. It was, upon its introduction, perhaps the greatest slap to the nuts the American auto industry had ever seen. I don’t think enough people appreciate just how earth shattering the Accord’s arrival in the U.S. truly was. This 1984 Accord LX represents from the model’s second generation and also the second to last to offer a three-door hatchback body style in the U.S.. Nineteen eighty four was a year after Accord production had begun in earnest at Honda’s Marysville, Ohio plant, however as it seems this is a West Coast car, its birth certificate probably says Japan on it. Power here is supplied by an 1,829-cc ES2 SOHC four with 86—yes, 86—horsepower. Those ponies are corralled by a four-speed automatic and are sent along to the front wheels in typical Honda fashion. The burgundy paint and underlying body look to be perfectly serviceable, however there does appear to be a sizable chip on the shoulder the rocker just behind the driver’s door. Louvers and factory wheel covers complete the ‘80s flashback weekend theme. Popping open one of the doors reveals an interior so red it might have been used as a bordello on the set of WestWorld. The cloth seats are lightly bolstered and look to be retaining their shape and original color, while the carpet is as vibrant and expressive as an infomercial spokesman. The same can’t quite be said for the steering wheel which belies years of handholding in its faded rim. A period-correct radio and cruise control round out the interior amenities. The ad does not note whether the car comes with A/C or not, but seeing as it’s an LX model it’s likely as I think they all came with A/C. Regardless, if it does it’s most likely old school R12. We don’t get to see the engine, but the ad notes that there’s only 24,000 miles on the clock. Those were all put on by the old folks—now apparently much older—so you know this car wasn’t driven like a rental by an angry ex. Overall, aside from that one bit of missing paint, it looks to be a solid citizen, albeit one form an era when performance in a family car was seen as different from today. 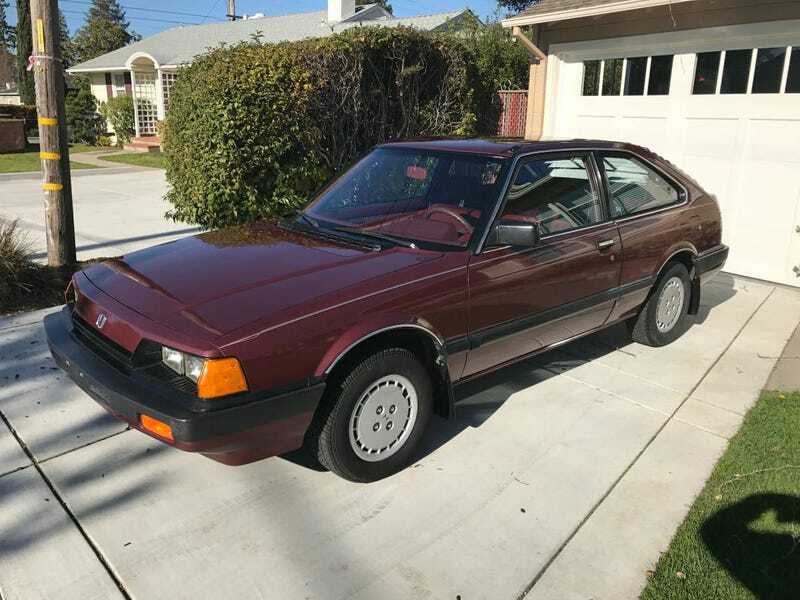 Still, if you’re a fan of old Hondas, or just want to see what an Accord hatchback was once like, you couldn’t do much better than this grandpa’s grocery-getter. How much would you pay for such an opportunity? The asking price is $3,700, which is a Benjemin below what the seller was asking a week ago. For that you get a clear title, and a classy car to call your own. What do you think, does that seem like a good deal for this old Accord? Or, for that much, would it have to come with some fresh-baked cookies and milk to be a deal? H/T to Cheapbastard for the hookup! For $3,950, Could This 1981 Chevy Citation X-11 Prove That A Citation Is Needed?